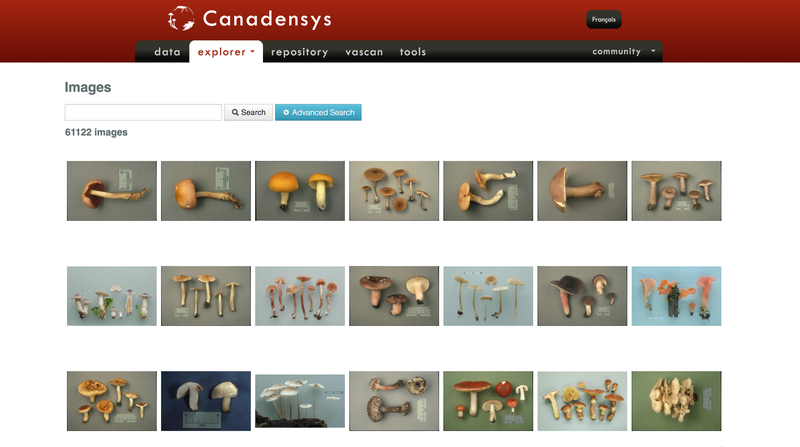 New Canadensys Explorer: get to know it! Our new Explorer, based on the Atlas of Living Australia framework, has been running for few weeks now. After month and month of hard work, this new platform is running and available! Some details has to be polished, but we are working on it! If you find some bugs or dead ends, please contact us. Why switching from a framework to another? It’s a question we’ve been frequently asked, and for which we have a simple answer: our old Explorateur was too small for our needs! Isn’t it fantastic? It means that we have reached our goals! A good reason to celebrate! But not a good reason to slow down! The new Explorer is faster and offer new functionalities and tools. But like every new tools, we need to get used to it. This is why we decided to show you what this new platform is able to do, and how to do what you were used to on the Old Explorer. During the next weeks, we will release tutorials on how to use the new Explorer, in order for you to use it efficiently. If you have specific questions, or suggestions of tutorials, please send us an email ! The principal tool of the new platform is the Explorer, but several other additional modules have been integrated and enhanced the visualisation and access to the data. The images are now managed in a separate module and can be visualized directly in the images portal. The images are of course also available from the occurrence page. 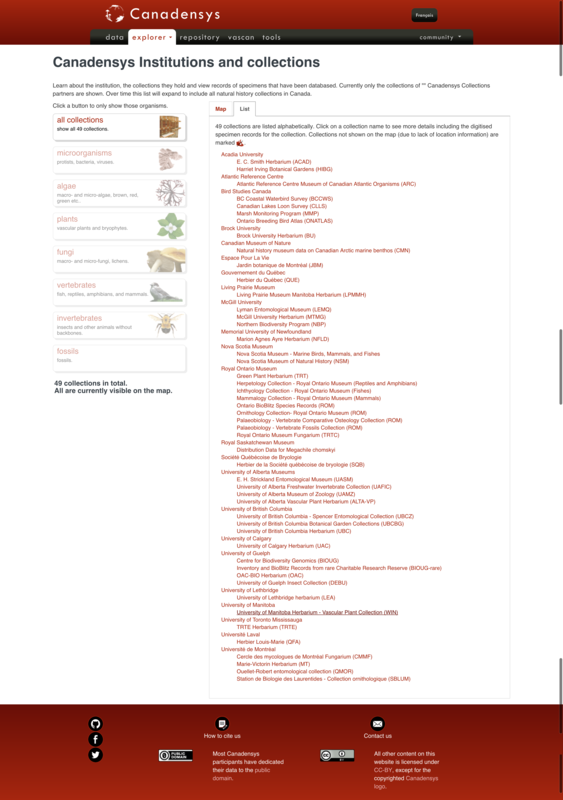 The collections portal gives access to all the collections indexed in the Explorer, as well as their respective datasets. From this portal, you can also choose a group of interest and have access to all the collections publishing this type of data. 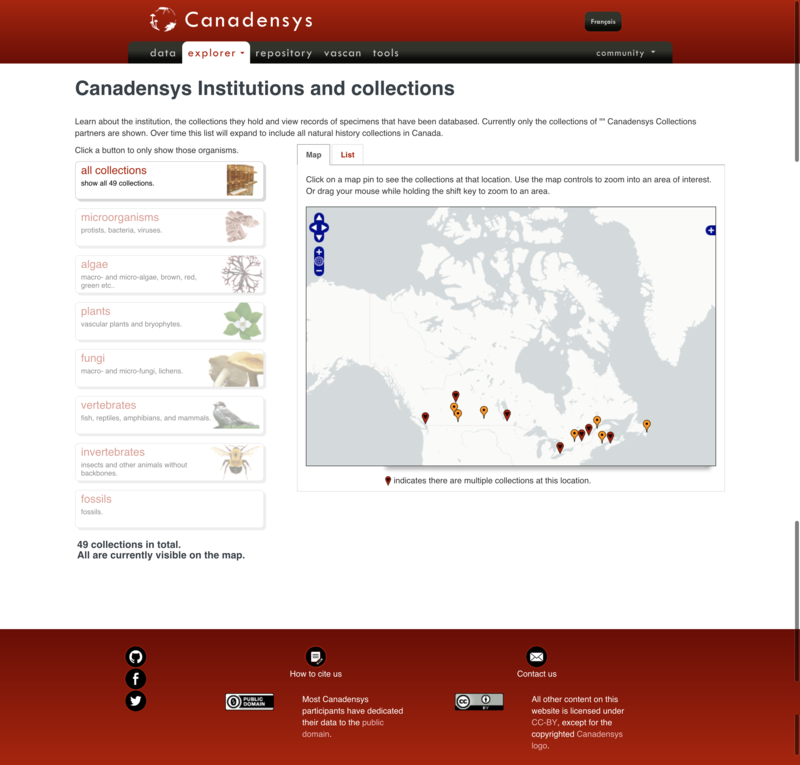 A great way to visualize the entire Canadensys network! You’re not on the map yet but you want to be part of the network? Email us so we can work together to release your data to the world! a spatial portal, allowing the linkage between occurrences and environmental, climatic and other biological layers. The scientific community will thus have access to a rich and powerful tool in order to analyze the biodiversity in Canada. a species portal, a display of the Canadian biodiversity. a Citizen Science data portal, enabling an easy publication of observations. a specimens transcription portal, where naturalists, professional and hobbyist could help transcribing data from specimens images. The tools already available on Canadensyse, like VASCAN and the coordinates and dates standardization tools will obviously be maintained. Tutorial n°1: How to have access to all the occurrences of a specific taxon? Tutorial n°2: How to have access to all the occurrences from a specific location?